फोटो या मूवी क्लिप को जोड़कर मूवी कैसे बनाये ? 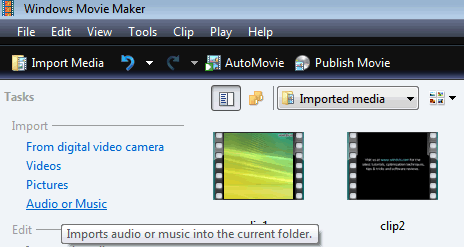 In this tutorial I’ll show you how to use Windows Movie Maker (a highly video-editing software in Windows Vista) to edit and create movies. In order to create or edit a movie, you must have a video file to work with. Let’s assume you imported 2 clips from your video camera and you’d like to join them together and add background music and transitions. 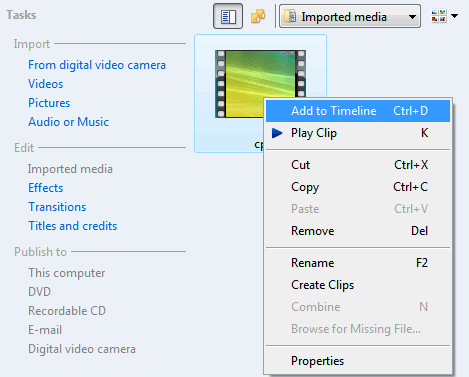 Open Windows Movie Maker by clicking on the Start orb – All Programs. 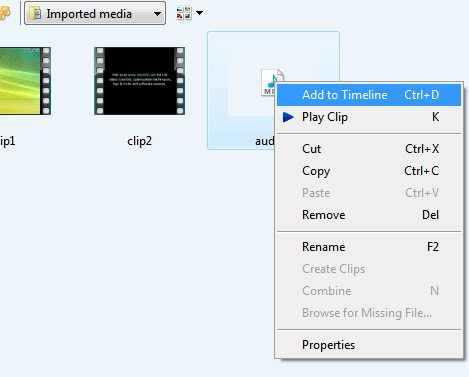 Click on the Import media button and select the two movie clips you want to work with. Right click on the clip and select Add to timeline – do this for both clips. Now that your clips are added to the timeline we can start modifying them. Note: to change the order of the clips on the timeline, left click on the clip and drag it whenever you wish. Let’s add some background music. Click on Audio or Music in the Import Section and select an audio file. Right click on the audio file and select “Add to timeline”. 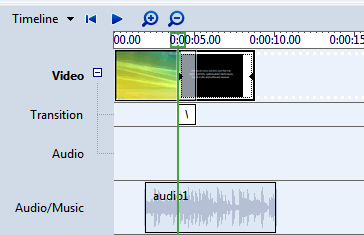 Not what the audio file is added to the timeline, we can synchronize it with the two clips. To accomplish this, position your mouse at the beginning/ending of the audio file (2 red arrows should appear) and drag it to the desired position. Next, let’s add a transition. Transitions make the passing from one clip to another look more aesthetic and professional. Click on the Transitions button, select a transition and preview it. Once you find a transition that you like, left-click on it and drag it on the last clip in the timeline. You should end up with something similar in the picture bellow. Besides adding a background sound and a transition, you can take this further and add Narrations, Credits and titles and other cool effects to your movie. The last step in creating the movie is actually publishing the movie. Click on the Publish Movie button, select where you want to publish it and…you’re done! और अधिक जानकारी के लिए निचे दिए गाते वीडियो की मदद लें .